Texas' explosive growth during the past decade was fueled by a boom in its minority population, which accounted for 89 percent of the total increase in population, according to the U.S. Census Bureau. County population change based on 2000 to 2010 census data. The state's explosive growth during the past decade was fueled by a boom in its minority population, which accounted for 89 percent of the total increase in population, according to the U.S. Census Bureau. Hispanics alone accounted for 65 percent of the state's growth over the last 10 years. The state's Hispanic population grew 42 percent over the decade. The black population was up 22 percent. Both outgrew the white population in percentage terms and in raw numbers. The white population grew by 4.2 percent. And while Texas added 464,032 whites over the decade, it added 522,570 blacks and 2.8 million Hispanics. In 17 counties, the Hispanic population grew by more than 100 percent. The white population in Texas now accounts for 45.3 percent of the total. Hispanics make up 37.6 percent of the population, blacks 11.8 percent and Asians 3.8 percent. The voting age population is a little different: 49.6 percent Anglo, 33.6 percent Hispanic, 11.4 percent black and 3.9 percent Asian. It’s not just the trend in Texas, but nationwide, according to Steve Murdock, a former U.S. census director and Texas state demographer who's now at Rice University. Six of the first 11 states to receive data saw a decline in the white populations and an increase it their Hispanic populations. The shift in demographics signals what he says is a necessary cooperation between the two groups. “You have this aging set of Anglos, literally aging off the end of their life chart who are going to need assistance in terms of Social Security, Medicare and in terms of direct care. At the same time, you have a young population that is overwhelmingly minority that needs the financial assistance through taxes and other factors of the older Anglo population to help get the education it needs to be competitive,” he said. Don’t be surprised to see Texas experience growing pains, he said. The state recorded about a quarter of the nation’s overall growth, about 4.3 million of the country’s 17 million. “We’ve had phenomenal rates of growth and we in Texas generally like that growth but we also have to prepare to pay for the implications,” he said. “It means more infrastructure, more educational services. I worry a great deal, if we forget with our older Anglo population that younger population, because that younger population is the future of Texas,” he said. Houston, with just under 2.1 million people, remains the biggest city in the state, followed by San Antonio, Dallas, Austin, and Fort Worth, which leap-frogged El Paso. Harris County, with 4.1 million residents, remains the state's largest, followed by Dallas, Tarrant, Bexar and Travis. Most of the state's largest counties kept pace with the statewide population growth rate of 20.6 percent, but Dallas County's population only increased by 6 percent, from 2.21 million to 2.36 million residents. The city of Dallas' population increased less than 1 percent, a fact that's likely to have implications for redistricting of urban seats in the Texas House. Suburban and exurban areas around Dallas County, however, showed strong growth, following a trend seen throughout the last decade in the rolling census sampling known as the American Community Survey. Both Collin and Denton counties grew by more than 50 percent, and Rockwall County lead all counties in the rate of growth (81 percent). A similar phenomenon occurred in Houston, where the city population grew by just over 7 percent, despite the influx of Hurricane Katrina evacuees who fled southern Louisiana in the summer of 2005. The city's current population is less than estimates from a few years ago, when suspected population increase once sparked a fight over whether City Council districts should be redrawn because of charter provision. Then-Mayor Bill White fought the effort, saying he preferred to wait for the official hard count released after the 2010 census. But all around Houston, population spiked since 2000. 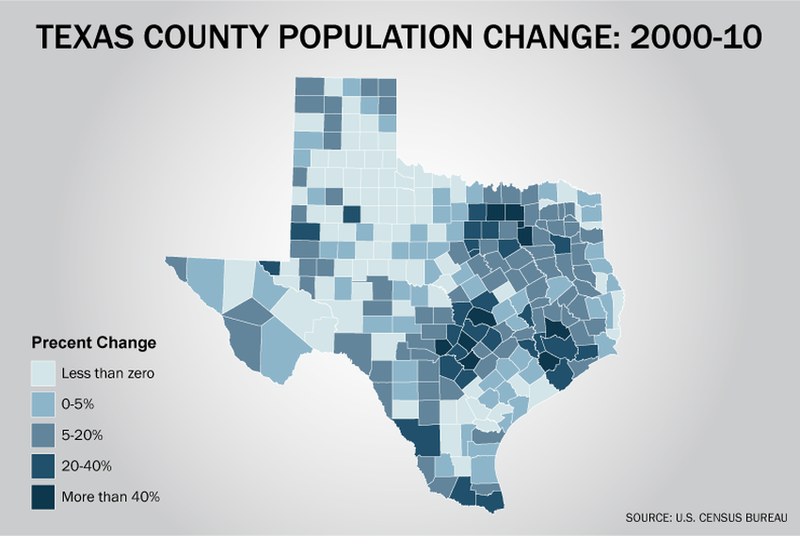 Montgomery County to the north saw its population increase by more than 60 percent, while Fort Bend County to the southeast grew by more than 50 percent. Seventy-nine of the state's 254 counties lost population during the decade, most of them clustered in West Texas. Another 97 counties grew less than 10 percent, and another 41 grew between 10 and 20 percent. The fastest growth, on a percentage basis, was in 37 counties that grew between 20 and 82 percent during the decade. Those are clustered in the Hill Country, the Metroplex, the Valley and around Houston. The jockeying is already well under way. Republicans argue that the latest election results show that three of the four new seats ought to be conservative. But the demographics of the growth should be the first concern, according to others. "The Latino community should receive three of the new congressional seats or better and should be properly represented in the state Legislature and on the State Board of Education," says state Rep. Carol Alvarado, D-Houston, a member of the Redistricting Committee. Legislative districts can vary in size by as much as 5 percent, based on current law and recent court rulings. But the perfect sizes are 811,147 people in each of the 31 Senate districts and 167,637 in each of the 150 House districts. State Board of Education districts also have to be redrawn; each of those 15 districts will have 1,676,371 residents. Now that they have the numbers loading into their computers, state legislators will begin redrawing their own political districts and those for the state's congressional delegation and the State Board of Education. • Dallas County lost enough population relative to the rest of the state to lose two of its 16 House seats. Every member of that county's House delegation is short of population, except for Democrat Helen Giddings. • Tarrant County, on the other hand, could gain a seat to add to the 10 it's got now. • Travis, Bexar and El Paso counties should be able to hold the number of seats they’ve got now. • Urban representatives in Harris County lost population, with the exception of Republican Ken Legler of Pasadena and Hubert Vo of Houston. A half dozen of that county's more suburban districts have more residents than they need. That county could lose one seat, but it's not a certainty. • Of the 150 seats in the Texas House, 96 are short of population and only 54 have too many residents. Generally speaking, rural and built-out urban areas either shrunk or didn't keep up with the state's overall growth rate, and suburban areas outpaced the rest. • Sixteen of the seats that stretch from the Texas border to the Panhandle in West Texas (not including El Paso) lost population equivalent to almost two seats in the Texas House. Rep. Warren Chisum, R-Pampa, has already shown some interest in running for the Railroad Commission, but that still raises the possibility that at least two members in that region will be paired when the maps are drawn. The chairman of the Senate Redistricting Committee, Kel Seliger, R-Amarillo, says the numbers were about what he expected. "No real surprises. If there are going to be surprises, it will be in the concentration of minority populations," he says. The Legislature is just getting the numbers loaded into its redistricting programs, and the patterns of where people live — the concentrations he's referring to — will become apparent with further analysis. In spite of the huge minority growth in Texas, Seliger says he hasn't seen anything in the numbers themselves that looks like a particular advantage to one political party or the other. The makeup of the Legislature is something else altogether. "If anything lends itself to partisanship [in the maps]," he says, "it's in the body, not in the numbers."